Whiff of Cordite went on its second trip of the season this weekend – a swift eight-hour round trip to Belfast. It was Leinsterman Palla Ovale’s first proper Ravenhill experience (Ireland A v Tonga doesn’t really count). Talk about timing – the old ground heaved as Ulster racked up a wonderful four-try victory that keeps them in the hunt. The highlight was the three fans behind us who with, as typical Nordies, refused to get carried away when Palla began to laud the Ulster display, responding ‘Aye, but Leicester are sh*te!’. Here’s our Good Week/Bad Week, and where else to start but at Ravenhill. Bananaman! If you closed your eyes slightly, you would have though fifteen Erics were playing on Saturday morning. Egg Chaser was enjoying a leisurely lunch with the family when he decided to check the latest score from the Zaffanella on the off-chance there would be a shock. Errr … no. It was 47-0 at half–time. Then the Erics added another 35 in the second half for a grand total of 82 points and 12 tries. Okay, it was only Aironi. But still. Aironi beat Biarritz last year, and gave Leicester a pretty uncomfortable time of it this year. They have home wins against Embra, Treviso and Connacht in the AAALeague and gave Cardiff and Ulster some heart-in-mouth moments. Sure, they are bunnies, and they target matches (Munster, 12th of February, watch your backs), but they are improving – they are certainly not an 82-0 team. If Clermont get 4 more tries and win on Saturday, they will likely have a home quarter final, and from there, anything can happen. Ask Eric. Scottish rugby has been in the doldrums for so long, you sometimes forget the positives. They have some decent back-row forwards, they should have won the Triple Crown in 2010, and they will soon have HupHupTim Visher. But they have loads of negatives. Glasgow have no history of rugby and struggle to get the deposit back from Partick Thistle Nil and are losing Richie Gray to Sale (Sale! ).Embra do well to pack 10% of Murrayfield on a weekly basis. So with those handicaps, its great to see Embra show such bronca – 2 last minute away wins, and a 30 point comeback in this group –its the stuff quarter-finals are made of. If they beat London Samoa at home, they are in. Given they might make it at the expense of Ulster, it’s a stretch to say we will be cheering them on, but no-one could begrudge them, and Scottish rugby, their day in the sun. There could hardly be much more goodwill towards Peter Stringer – we were in a Bath pub full of travelling Leinster fans who loudly cheered his debut appearance against Ospreys. What a pity to see his kick charged down, resulting in a Biarritz try on Sunday. His boot out of play to secure the win also went at a strangely low trajectory – it would have been funny-painful to see Ngwenya catch it on the full and gallop in for a winning try. Things have gone well for Strings up til now – he’ll put this one behind him. Pedigree is often argued to be the crucial ingredient in the Heineken Cup – it’s what digs Munster out of tight spots and gets Toulouse through the group stages without breaking a sweat. Biarritz and Leicester have it in spades, but it will only get you so far. Both are a pale shadow of fomer sides. Biarritz were never the most watchable of teams, but the forward power that used to intimidate is no longer there. Leicester became a rabble on Friday night. They are admittedly beset by injuries, but they don’t appear particularly strong in any unit. Castro is no longer the force of old, and the backrow was anonymous on Friday, smashed to pieces at the breakdown. 12×3 had a meltdown, and Ben Youngs is starting to look a bit overrated. Both these teams will be focussing on domestic affairs for the rest of the season. Oooooohhh Barnesy, what a week! Darren Cave took him on in his Sunday Times interview (questioning his pick of Leicester as among the favourites), and came out on top. After the Friday debacle, he made an extraordinary admission: that the Rabo Pro12 is better, and quicker, than the Premiership. The Premiership Sky Hype, the perennial excuse that the powder-puff Rabo gives the Celtic sides an unfair advantage – all gone in a flash. You half expected the producer to get in his ear and make him recant. After Leinster put seven tries on Bath at Lansdowne Road, one radio reporter mentioned that he’d overheard a fan in Kiely’s say ‘They might as well give us the Cup now.’ The bookies have anointed Leinster as probable HEC winners and, in end of year predictions bloggers and commentators queued up to forecast another Leinster HEC win, with several throwing in a Rabo Pro12 title for good measure. Things are certainly looking rosy in the Leinster garden. In spite of injuries to BOD and Shaggy, they look set to secure a home quarter-final in the Heiny, and are nine points clear in the Pro12. Jamie Heaslip is looking like his old self and Johnny Sexton is looking Europe’s premier fly-half once more. Fergus McFadden and Eoin O’Malley have pitched in at centre to good effect and the return to fitness of Rob Kearney and to form of LukeFitz have partially offset the backline injuries. They can afford to mix up their team according to their opponent, playing a vdMerwe-Browne-McLoughlin-Boss axis for physical away days, and unleashing Church-Toner-Jennings-Reddan at home when they look to play at lightning speed. Their success is generally built on a high tempo attack and in particular phenomenal aggression at the breakdown, where the likes of Heaslip, Healy and Jennings hurl their bodies into the wreckage to continually generate quick ball. Even when they butcher all their try opportunities (Bath away) or just play rubbish (Connacht away), they still seem to find a way of winning. It’s all enough to make this Leinster fan decidedly nervous. There are umpteen reasons to be cautious. Firstly, it needs to be borne in mind that the Heineken Cup is a strange competition in many ways, not least its bitty, broken structure. Once the home quarter-final is secured, the team breaks up for a whole Six Nations. Who knows how the players will return? Will Sexton be in the same frame of mind? Will Ireland’s cumbersome attacking patterns need to be coached out of the players’ systems? Who’ll be injured? It’s like qualifying for an entirely different competition. For another, there’s the all-important (too important to be truthful) semi-final draw. Leinster, good as they are, would still travel to Clermont or Toulouse as second favourites, and a trip to Saracens would be something of a coin toss. As champions, they are there to be shot at, and the historical difficulty of retaining the Cup is so well established we need not dwell on it. It’s also important to note that the Heineken Cup isn’t necessarily, or even all that often, won by the best team, but that which can continually stay alive. Once you enter the spring, it’s a knockout competition, in which you’re always one game from going out. Leinster were superb from start to finish last year, and deservedly took the spoils, but it doesn’t always work out that way. It may be more instructive to look at their 2009 victory, when they were dismal for at least half the group stage, and decidedly fortunate to emerge victorious from a freakish quarter-final against Harlequins. Leinster would also do well to remind themselves of what fate befell Munster that season. For it was they, at the time, who appeared unbeatable. After the twin peaks of the 22-5 win over Leinster and the 39-6 thrashing of the Ospreys, back-to-back Heineken Cups seemed inevitable. Such performances can paper over the cracks a little. Munster looked flawless at the time, but Michael Cheika recognised that neither of their centres were distributors and ruthlessly exposed them. Similarly, Leinster have a glaring weakness in the second row, which has yet to be properly tested. Nathan Hines’ importance to last years’ team is well documented – on top of that, Leo Cullen appears to be in decline. Devin Toner has improved immeasurably, but will it be enough against a Toulouse or a Clermont (hello again Nathan!)? And don’t forget he is still playing second fiddle to Damian Browne (it feels like we should emphasise his name somehow, but that wouldn’t be entirely fair) on away-days. Joe Schmidt is an outstanding coach, but this year he has another aspect of the game to manage: expectations. He must do his utmost to ensure that the warm, fuzzy feeling emanating from the stands doesn’t impact too much on the players’ mindset. If he can do that, and Leinster do land back-to-back Heineken Cups, their third in four years, with the Pro12 to boot, then we can declare them even better than the great Munster, Wasps, Leicester and Toulouse sides of the professional era. But not before. Stuart Lancaster revealed his 32-man squad for the Six Nations this luncheon, with nine new faces arriving. He’s kept faith with a core of tight forwards, (Cole, Stevens, Palmer, Deacon, Hartley) but outside that dark region it’s going to be a new-look England. We can expect to see a backrow featuring Ben Morgan at 8, and any two of Wood, Robshaw and Croft. 10-12-13 will be interesting and it’s not entirely clear how that will look. Charlie Hodgson (yes, him) has been recalled, and Lancaster may see him as the wily old head to steer the ship from 10 while the young guns busy themselves around him. It will look like a mad call to Hodgson’s many detractors, but in Flood’s absence there aren’t that many other compelling options. Still, it looks a weak point. Some things never change though, and it seems Lancaster couldn’t resist picking a couple of inside-centre boshing machines in Barritt and Turner-Hall; while that in-vogue openside remains as elusive as ever, with Andy Saull having to bide his time in the Saxons squad. Still, it’s a brave new-ish world and all that, and we’ll watch with intrigue as they travel to Murrayfield for their first game. Oh dear. Would that be the culture of self-aggrandisement, and the environment of oafish behaviour? Surely the whole plan was to build a new culture from the bottom up. What we also don’t understand is why there was no requirement for the likes of Shontayne Hape to learn the “culture” – he wasn’t even English, but was fast-tracked into the squad with nary a peep from Dallaglio. Maybe there is one rule for ageing boshers and another for young tyros. The ’03-ers are rightly considered Heroes of English Rugby, and all have retired with unimpeachable reputations (on the field anyway). The problem for English rugby is that many have retired to the soft seats of the media, and their opinions on the current national set-up (again, rightly) carry a lot of weight. You can’t shut them up, but every unconstructive utterance such as Dallaglio’s will erode the fledgling confidence (such as it is) of the new generation. Plus, as we are tired of banging on about, it will remind everyone that the team aren’t doing as well as ’03… and are daring to pass the ball wide in the process. Ergo – bosh it up the middle to win. Stopping just sort of “… because we deserve it.” Here at Cordite Towers, we wish the newbies, especially Farrell and Morgan all the best – it’s not going to be an easy ride. PS. of course, the real indicator of the new culture in Team England is this: if Chris Ashton does his charming swallow dive when he scores his first try in the Lancaster era, forget about it. Out of contention. Probably a co-incidence but nothing has gone right since Gerry wrote one of his hagiographies on him. Undoubtedly a talented lad but Connacht’s lamentable run has taken it out of even their better players. Needs to be given a little rest and told everything is going to be ok. Poor lamb. Challenge has faded a bit in spite of some classy moments. The sight of him being smashed out of the way by Beaver (at the Aviva) has been hard to shake from the memory. Showed nice touches off the bench against Ulster, but needs to get selected for at least one HEC game in the next fortnight to stay in the hunt. We are still not sold on Fergus as an outside centre, but he has had a good few weeks. Rock-solid place-kicking is a string to the bow, and while his partership with D’arcy is a bit boshtastic, his familiarity with the Wexford man will do his chances no harm. Plus he is already in the squad – which gets him past Deccie Hurdle One. In the shake-up for sure. Another try on Friday night, but the lack of televisual coverage precludes us from commenting on his performance. This Friday night against Leicester represents a huge shop window for him. If Paddy Wallace were to return the Ulster backline he could even some good attacking ball, especially if Pwal is outside a Marshall/Pienaar combo. What possibilities! Has been largely out of the picture since loss of form and Earls’ return. Colonel Sanders Toland was screaming for his call-up in his bizarre article last week (Ian Whitten??) but its not going to happen for a while yet. When it comes to us and Keith, it’s… complicated. Defensively frail, low on confidence and not a particularly brilliant footballer, but the boy has gas and, with a far better try-count than LukeFitz or Andy Trimble, we recognise the value of his outstanding finishing ability. We also feel he’s been hard done by in how much he’s been moved around. This season, he returns from injury only to find himself back in the centre, after playing wing all last year. In truth, we’ve never fancied him as a 13, but we do have to accept he’s played pretty well these last few weeks. 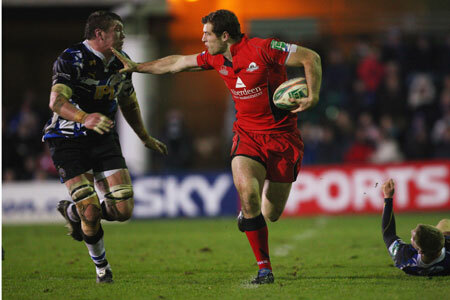 In the Scarlets game he showed up well in spite of playing outside Mafi, who was having a mare. Against Connacht, he showed deft hands – not usually his strongest suit – to send Scanlon over for a great try, and against Treviso his quick feet and hard line got him a nice try. We’ve been resigned all along to Deccie picking Earls in the 13 slot, but it might not be as bad a decision as it looked a couple of months ago. We doubt he is the best long-term option, but he deserves a shot. We’d have liked to have seen one or both of these play 13 over the last few weeks, but it looks like it’s not going to happen at this stage. Luke’s resurgence has been one of the big positives of the year, and one facet of Earls conversion to centre will be to squeeze himself or Trimble into the XV. 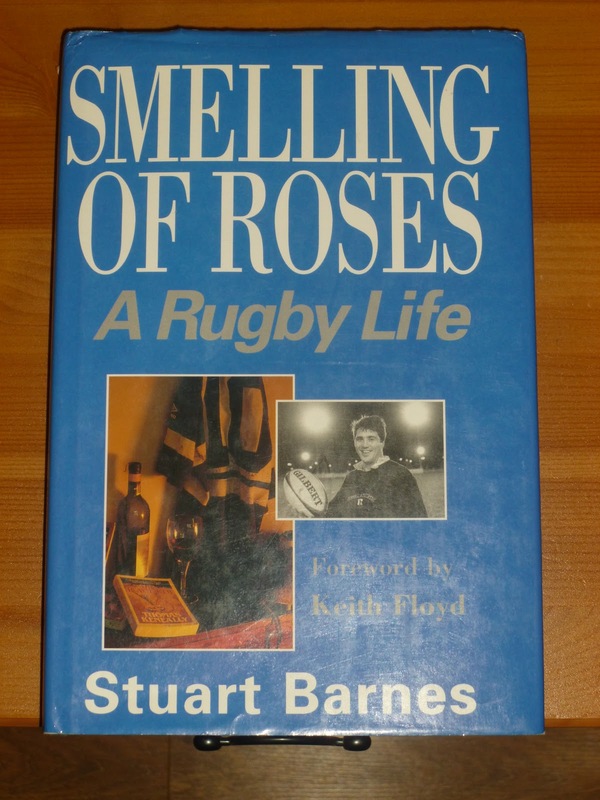 Stuart Barnes – a salute! Early Christmas Day, Egg Chaser looked at the pile of presents under his tree. Pondering which one to open first (he has many siblings, and thus was confronted the agony of choice), he picked a vaguely book-looking gift, and opened it. So far, so sports-biography predictable. But what was new? What pearls of wisdom were spoken by our favourite rugger pundit that illuminated the festive season? Firstly, his rugby education is Welsh, which certainly puts a new perspective on his rugby outlook. Barnesy was (and is) a huge Arsenal fan from Essex who loves soccer. He did not even know what a rugby ball was until Clan Barnes moved to Wales when he was 12 or so. His school (the same Alma Mater as deranged mouth-frothing hack Stephen Jones) in Newport made him play, and he was captain in his first year. He played for Welsh Schools, and narrowly missed out on a place on the Welsh bench for a 5 Nations game in his last season in Wales before moving to Oxford University, where he declared himself English. What else? He doesn’t hold back. 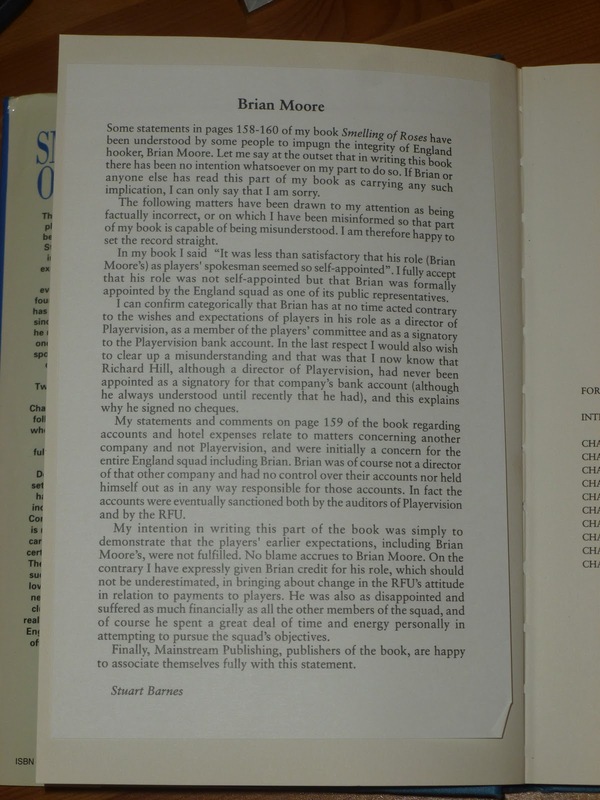 The very first page of the book contains a glued-in page with a lengthly apology for any perceived insult to Brian Moore in the book. And it continues in a simliar vein. Geoff Cooke was unimaginative and controlled Bum-chin Carling and Moore, reining in their on-pitch rebellious tendencies and making them automatons. Cooke’s fly half, Rob Andrew, reacted to the threat from Barnesy by standing 10 yards behind the scrum and kicking the corners – safety-first no-mistake rugby – to ensure he wouldn’t make an error and be dropped. Andrew (and Cooke)’s view that a 10 is a cog in the machine and not the driver of the machine itself is heavily criticized. The sainted Ian McGeechan (now, of course, Bath coach) – disinterested in the peripheral Lions and unable to react to what was in front of him on the 1993 Tour. Moore and the Players Committee in the few years before professionalism (which Barnesy considered inevitable) – naive and shambolic. It’s amazing stuff. In our opinion, the most interesting thing was his consistent argument against Groupthink in English rugby, perpetrated by the (then-and-now) powerful English rugby media. Recently, Barnesy has talked about how ex-playing pundits are largely drawn from one club (Leicester, presumably) and that clubs’ ethos/gameplan is largely uncriticized and thus considered a zenith. No room for alternatives are discussed or acknowledged if success is the goal. In the book, he continually refers to the idea that because England didn’t win a Grand Slam in 1990 playing ambitious rugby, and did in 1991 and 1992 playing 10-man stuff, 10-man was the only way to play. The idea that there was a potentially better and more successful way was not on the agenda. The sight of England bottling the 1991 RWC final is a particular bugbear for Barnesy. Now, admittedly, back in 1994, this was pretty self-serving. If England did want to expand their game, they were hardly going to ignore the best 10 in the country at running a backline to do so. But the point stands and is just as relevant today. England won the RWC in 2003 with a team that had already peaked that summer and was so fearful of losing they boot-and-bullocked it .. crucially, they had the personnel to do so successfully. In both subsequent RWC tournaments, when the pressure was on, all ambition was ditched and they reverted to the 2003 type, despite having nothing like the capability to execute the gameplan. They fluked their way to a final in 2007, but the chickens came home to roost this year. Even thinking about England’s approach between tournaments, consider a list of attacking players who have all played for England in the last 10 years and been ditched sharpish after 1 or 2 mistakes: Olly Barkley (23 caps in 10 years), Charlie Hodgson (36 caps in 10 years), Danny Cipriani (7 caps, rushed back and then humiliated by Johnno), Olly Morgan (2 caps), Dave Strettle (7), Shane Geraghty (6). Now, they aren’t all the answer to England’s problems (here’s looking at you Charlie), but there is no doubt all of them would have more caps, and more encouragement, had they been Welsh, Irish or French. Contrast to, say, Shontayne Hape (13 caps in 18 months and not one notable memory), Mark Cueto (55 caps in 7 years, consistently not at international level, but so many recalls we have lost count), Matt Banahan (16 caps in 2 years – more than Cipriani and Strettle combined). What would Barnesy say? It’s easy to guess, and one doubts Danny Cipriani would be in Melbourne if the Barnesy’s of this world had their way. Barnesy, as ever, we salute thee! Scottish rugby has been the sick man of Europe for the last few years. The dismal Six Nations results, the awful rugger, the demise of the Borders, the piddling attendances and the lack of playing numbers – the feeling that Scotland will be passed out by Italy has been coming for a while now. Sure, each of the other Six Nations have endured fallow patches, but none are as sustainedly concerning as Scotland’s. The recent World Cup only appeared to confirm this. The Scottish pack manned up fairly impressively, and refused to let the big, brutish fellows from Argentina and England bully them, but Lordy, their attacking play would have disgraced a half-time rugby minis match. The simple act of passing a ball across a pitch at chest height appeared to be beyond them. Following that, the news that leading light and poster boy Richie Gray was off to Sale – Sale! – next season was another body-blow Scottish rugby could ill afford. But if Scottish rugby is dying, then at least there’s a twitch in it yet. Glasgow and Edinburgh have surprised with their results in the Heineken Cup, while Glasgow are also going well in the Pro12, currently sitting in third place. Indeed, Edinburgh have a real chance of qualifying for the HEC quarter finals – they sit on 13 points after three wins, jointly top with Cardiff, having slayed the Blues in the Scottish capital in Round Four. Glasgow’s chances of qualification are slim, as they have the small matter of Leinster to contend with, but have nonethless performed admirably with two wins and a draw so far. They were, admittedly, drubbed in the RDS, but these things can happen. So where has it all gone (sort of) right? In Embra’s case, they have one thing that Scottish rugby has lacked for eons – a genuinely threatening outside back. Flying Dutchman Tim Visser has 13 tries already this season, three of which have come in the Heineken Cup. He’s a similar sort of player to George North, a big, strong, quick wing, who uses his long go-go-gadget arms to great effect; he has one of the best fends in the game. He gives them a focal point for their attack, which has plundered ten tries in four HEC games so far. A cursory glance at the Rabo Pro12 points scorers table reveals a Duncan Weir of Glasgae comfortably in the top spot and Embra’s Greig Laidlaw in fourth. Weir is only 20 and a bit funny looking for a fly-half (let’s just say he’s in the Andy Goode mould of physique) but he has been racking up points at a solid rate. Ruaraidh Jackson is now back from injury and on his case, but this can only be positive news. Further good news for Glasgae has been the return of one Lamont (Rory) from Toulon, and imminent return of the other. It at least partly offsets the desertion of Max Evans and Richie Gray. For Edinburgh yesterday there was more good news, with two promising 10s, Harry Leonard and Gregor Hunter, signing new contracts. The question is: can these good results (and positive vibes) be transferred to international level? Predicting a Scottish revival is a risky business: the Guardian boldly predicted they’d finish second in last year’s Six Nations and ended up looking rather foolish. The trouble is, they simply cannot score tries, and have a tendency to freeze on the big stage (see last year’s non-performance at home to Wales). It’s instructive to note that Edinburgh’s match-winning try against Cardiff in the Heineken Cup was created by a scorching break by Nick de Luca. de Luca has long been touted as the solution to their ills but we are still waiting to see him produce a performance of note at international level. Unfortunately, Visser doesn’t qualify until the summer tour, so that rarest of breeds, the Scottish try, may not be spotted for a while yet. Haughton; Varndell, Waldouck, Flutey, Wade; Robinson, Simpson; Payne, Webber, Broster; Birkett, Wentzel (c); Du Plessis, Poff, Jones. Cipriani; Sackey, Waters, Lewsey, Voyce; King, Reddan; French, Ibanez, Vickery, Shaw, Palmer, Worsley, Rees, Dallaglio (c). Not one survivor, and you’ll be forgiven for not being overly familiar with the likes of Broster, Birkett and Poff! Ah, the festive season! Turkey, toy fights, rum & coke and Barnesy’s autobiography in the stocking – we all know the drill. Oh, and interprovincial rugby. The twitching corpse of tradition lives on in Irish rugby with the October/December/April series, and there is nothing more seasonal than a few glasses of Pimms at the RDS, a few pints of Guinness at Thomond, a few thumps of the Bible at Ravenhill, or a few lost souls at the Sportsground. So, how did they go for each of the provinces? We rate the Christmas gifts bestowed by Father IRFU. On Stephen’s Day, the kids went to RDS and didn’t disgrace themselves by any stretch of the imagination. They looked well-drilled and composed, and were down just 8 points after 60 mins before the predictable onslaught began. After that, they filleted Munster up front and looked very threatening with ball in hand – you had a recollection of last season when a stuttering first half of the season was turned around in the New Year. Ruan Pienaar is now back and with most of the rest of the playoff contenders down key men while Ulster welcome them back, is there a possibility of simliar run to last season? They will look for a semi-final not against Leinster, and hope Andrew Trimble is on to the right man upstairs when they go to the Marcel Michelin. New Year’s Resolution for 2012: Put together a run of wins. Ulster are seven points off the playoffs and an extended run is required to propel them up the table. Something of a curates egg for Munster – a very poor Connacht were easily swatted aside in a game they learned little about themselves in, but they were bossed around in Ravenhill in a game reminiscent of a different era. The scrum was bullied, Duncan Williams was awful, and Ian Keatley looked what he really is – a 10 who is still learning his trade. On a brighter note, Earls was back – and showed beautiful hands for set up one of the tries in the Connacht match. However, judging by some of the performances by the other outside backs, they need three of him. And he is still defensively suspect in a key position. It’s an important few weeks for Munster – falter in the HEC (by which we mean 5 points or less in 2 games) and a trip to Toulouse or Clermont beckons. So, just the right time to have your most dangerous finisher missing tackles in the midfield, eh! New Year’s Resolution for 2012: Develop an attack. Their pack have manned up well so far, but their back play is still clueless. They’ll need to get some coherence for the sharp end of the season. In general, Leinster are motoring so well at the moment that even Gerry is conceding they are “almost Toulouse-like”. However, despite the wins, this wasn’t the most satisfactory Christmas in D4 – a very experienced front 8 took far too long to subdue the Ravens, and the main worries (replacing Hines, BOD and Shaggy) are still leaving a too-much-turkey feeling in the stomach. But that’s a measure of the sky-high expectations. They will be hoping Leo Cullen recovers the form of May and not December 2011, and that talk of a double does not get too far out of hand. In truth, Joe could do with expectations being dampened, so he might be a little happier after the Great Escape of Galway. And to be more truthful, if it’s going to be a HEC semi-final trip to Toulouse or Clermont (or Wembley to meet Saracens), they will need their A game, and even that may not suffice in France. New Year’s Resolution for 2012: Tighten up on D. Leinster’s two wins showcased their superior squad depth, but they have leaked more tries this season than last. If they are to achieve back-to-back HEC’s, there’ll be no place for soft tries. Plus ca change, plus c’est le meme chose. A shockingly poor display against Munster (it was almost as if they felt it would be impolite to ruin The Bull’s swansong by trying) was followed by a tough and gutsy one against Leinster … with exactly the same outcome – another defeat. Elwood is all optimism but when the focus isn’t there, they are rubbish. The attacking patterns are appalling and they really look drained – the losing sequence is taking it out of them. Given the size and make-up of the squad, Eric was probably hoping for 6 to 7 league wins to bank at this stage. Instead, they have just 3, and despite the fact they won’t lose (m)any players during the 6N, it’s hard to see what will be the catalyst for a turnaround. If Aironi get their freak on, it could be Connacht returning to familiar barrel-scraping territory in April. New Year’s Resolution for 2012: Where to begin? Connacht just have to get a win from somewhere to break the losing streak. Improved place kicking would help. They travel to Aironi next – lose that and they’re in trouble.